Scan with ease. Process with power. The MX6500e Multifunction Option provides you with the flexibility needed to create a powerful MFP system that meets your capturing, printing and finishing needs. Delivers fast single-pass scanning at speeds of up to 86 images per minute. Turn critical business information into available and actionable data in a matter of seconds. The MX6500e accepts a wide variety of media, from rigid identification cards to thin carbonless paper, up to and including tabloid (11x17 inches or A3) size. Easily connects to Lexmark MS710 and MS810 Series laser printers to add full multifunction capability. 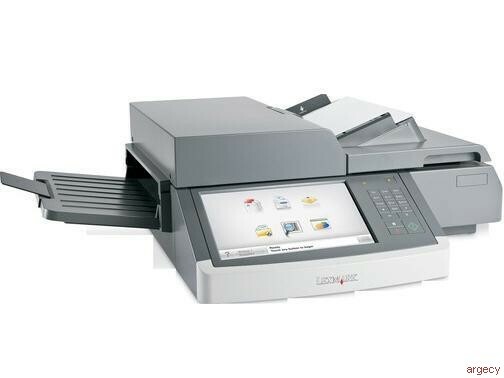 Enjoy the convenience of copying, faxing, e-mailing and scanning. Put powerful workflow solutions to work, at no additional cost. Yoi'll get Scan to Network Premium, Barcode Discovery and Scan to SharePoint pre-installed on this device. The modular, ergonomic, wheelchair-accessible design gives you flexibility to place the MX6500e wherever you need it. And the 10.2-inch color touch screen is designed for clarity and accuracy. Compatible with Lexmark MS710dn, MS711dn, MS810n/dn, MS811n/dn and MS812dn printer models. 8.27 x 23.43 x 22.13 in. 13.39 x 27.95 x 26.77 in.